Rüsselsheim. For one hour the Hockenheimring took a break from its normal hectic routine. The test teams with their formula racers and touring cars lay down their tools and lined up along the pit wall - and there they were: 75 pristine Opel GTs from all over Europe thundering past start-and-finish. Opel Classic brought the oldest GT from 1968 ("the number 1") and the youngest from 1973. The field was led by Walter Röhrl, 1982 world rally champion with an Opel Ascona 400, and the designer of the GT, Erhard Schnell, as co-driver. The two sat in Röhrl’s private silver Opel GT. Opel racing legend Volker Strycek was there as well, in his own Opel GT Junior with rare tuning variants from Irmscher and Conrero also spicing up the field. All of them were and are part of the Grand Tour, which the umbrella organisation of the European GT Clubs is running between September 19 and 22. The finale will take place on Saturday at the Opel Test Center in Dudenhofen. The reason for the “fast” laps over the Hockenheimring was the 50th birthday of the Opel GT. Almost exactly fifty years ago, from October 21 to 29, 1968 to be precise, Opel had held the GT test days at the racetrack. At the time of the presentation, 41 Opel GT 1100 and Opel GT 1900 as well as 44 other sports models from the Rallye Kadett to the Commodore GS were there. Journalists, dealers, salesmen, customers and racing drivers were able to put the car’s talents to the test themselves. And true to the advertising slogan "Only flying is more beautiful" Swedish rally drivers Lillebror Nasenius (European champion 1966 with an Opel Rekord) and Sylvia Österberg showed what the new sports car from Rüsselsheim was capable of – including jumps! Fifty years later, two-time World Rally Champion Walter Röhrl steered his Opel GT around the Hockenheimring with inimitable precision. The perfectionist behind the wheel bought his Opel GT from a long-time companion. Herbert Fabian rescued the second world title for Röhrl in 1982 when the Opel chief mechanic installed a new rear axle on the Ascona 400 overnight at the Ivory Coast Rally. Röhrl and his co-driver, Christian Geistdörfer, went on to win the rally and thus the world championship. During the Grand Tour Walter Röhrl also met the artist who gave the GT its unique shape, Erhard Schnell, for the very first time. The designer is still a great fan of his creation even at the age of 91. “The reactions were huge back in 1968, but today I feel like the GT is even more loved,” he says. Schnell took on the role of co-driver for Walter Röhrl in Hockenheim. Back in the paddock, Röhrl had an idea: he asked Schnell to sign his GT on one of the legendary folding headlamps. It is the first time that Röhrl has asked someone for an autograph. 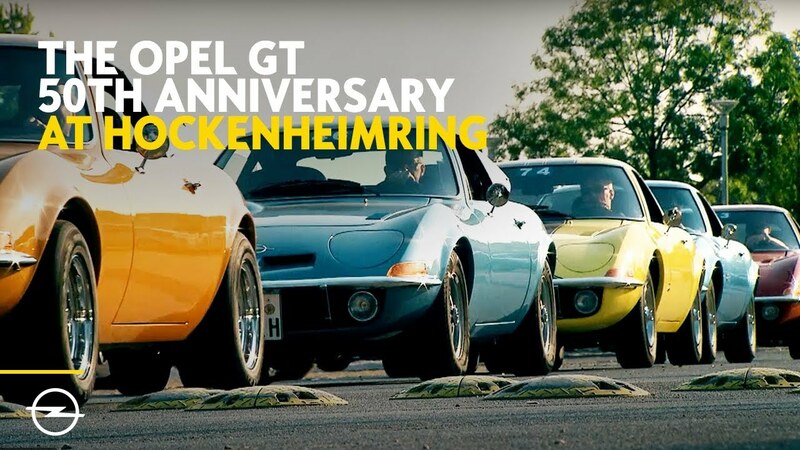 Everyone linked to the Opel GT wants to be part of the festivities in Hockenheim: The president of the American GT Club, Gil Wesson, has flown across the pond. He had already organised an eight-day birthday tour along the legendary Route 66 earlier this year. The director of the Grand Tour, however, is Olaf Moldzen. The German heads the European Federation of Opel GT Clubs. This currently includes 28 clubs with around 1,450 members and 1,550 vehicles. It goes without saying that Moldzen is also in Hockenheim with his 1969 GT 1900 – an Irmscher touring car. Speaking of racing cars: in addition to a second, newly built coupé from Opel-tuner Irmscher there is a Conrero GT on the track. The racer from Italy is the hero of the 1971 Targa Florio, where it fought off more powerful competition from Porsche. Elsewhere, the orange GT 1900 Junior owned by Volker Strycek is also an absolute eye-catcher. In 1968, the first Opel GT rolled off the line, previously thoroughly validated in the then new Opel Test Center in Dudenhofen. The sports coupé was the result of a Franco-German cooperation and thus a genuine European: French coachbuilders Chausson and Brissoneau & Lotz, well known at Opel due to previous projects, took over the pressing and welding of the sheet metal parts as well as painting and interior equipment. The assembly of chassis and engine took place in Germany. For the GT customers there were two engines to choose from: a well-known 1.1-liter four-cylinder with 60 hp from the Kadett family and a 90-hp 1.9-liter engine from the Rekord. The GT 1900 was in particular demand right from the start. With a top speed of 185 km/h and zero to 100 km/h acceleration 11.5 seconds, it set the pulse of sporty drivers racing. A very precise manual four-speed gearbox came as standard. The optional three-speed automatic was of little interest to European customers, but it was very popular in the USA. Almost 70 percent of the 103,463 GTs produced found their first owners there. Meanwhile, many of these exports are now back in Europe and some of them are celebrating the 50th anniversary of the Opel GT – on the Grand Tour 2018.